With Mother's Day this weekend, I wanted to share with you a recipe that I love to make and is definitely one of my Mum's favourites. It is a chocolate cake with a chocolate ganache which is then layered with fresh raspberries and a raspberry mousse. This is so easy to make and will look incredible. To make it look amazing I have decided to layer it up in medium sized jars but you could easily make one larger cake and layer up with the chocolate ganache, fresh raspberries and the pink raspberry mousse. This looks so pretty with the contrast between the chocolate cake and the pink mousse and is such an incredible combination of flavours. Preheat the oven to 180C. Line two deep baking trays with baking parchment. For the chocolate cake, put the cocoa powder and the dark muscavado sugar into a large bowl and pour in the boiling water. Whisk the ingredients together, and then set aside. Cream the butter and caster sugar into a separate bowl, until it becomes pale and fluffy. Then stir the flour, baking powder and bicarbonate of soda together in another bowl. Pour the vanilla extract into the creamed butter, and whilst mixing all the time add one egg at a time. Gradually sieve in the flour a bit at a time and stir. Finally, mix and fold in the cocoa powder. Divide the cake mixture in half and pour each half into the two trays. Then place in the centre of the oven and bake for 20 minutes or until a skewer comes out clean. Leave to cool in the tin for 20 minutes and then allow to fully cool on a wire rack. For the raspberry mousse, pour the double cream into a bowl and whisk until it can hold its shape (you can whisk it by hand or use an electric whisk). For the raspberry coulis, place the raspberries, lemon juice and icing sugar into a saucepan and heat until the raspberries start to break down. Then transfer to a blender and blend until it is smooth. Then pass the mixture through a sieve. Then pour the raspberry coulis into the whisked double cream and mix until the cream has changed to a light pink colour. Alternatively, if you don't want to make the coulis you could buy ready made raspberry coulis instead. For the chocolate ganache, break up the dark chocolate and place in a glass bowl. Pour the double cream into a saucepan and heat the cream over a medium heat. Bring just to the boil, being careful to not let it boil over, and then pour over the dark chocolate. Whisk until it is smooth and silky and all the chocolate has melted into the cream. To assemble the jars, cut the chocolate sponges in half so you have a thin piece of cake. Then cut out circles (make sure it is the same size as the jar) of the chocolate cake until you have four pieces for each jar. Then spread a thin layer of the chocolate ganache on one side of each piece of the cake. Then sandwich two pieces of the cake together so it looks like mini Victoria sponges. 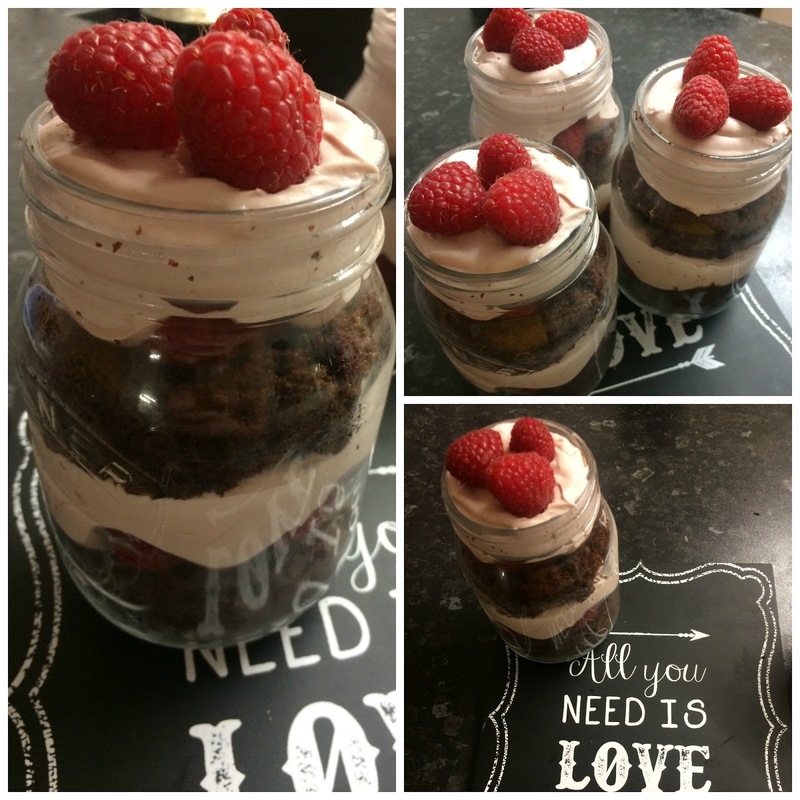 Add one mini cake to the bottom of each jar and layer a few fresh raspberries on top. Then add a layer of the raspberry mousse. Then repeat by adding another mini chocolate cake and layer with more raspberries and then finish with the raspberry mousse. Finally decorate with a few fresh raspberries on top. You could also sprinkle some icing sugar on top but this optional. Then tie some string around each jar and tie into a bow.